I don’t know if it is the fact that 40 looms in the distance or that I am evolving in my health habits, but I have become increasingly less interested in alcohol and coffee. Whereas a cocktail or glass of wine was a given part of our routine throughout the week and coffee every morning, these beverages have become a treat instead of part of our daily lives. I have definitely noticed more energy, more productivity, and better focus throughout the day. We have been skipping the caffeine and alcohol and opting for mocktails, aka faux cocktails.. Mocktails are so refreshing without the negative effects of alcohol and caffeine. 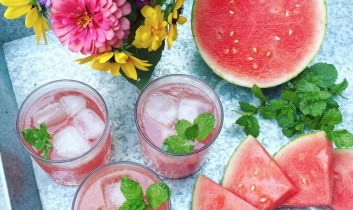 One of my favorite, most refreshing mocktails we’ve created is the Watermelon Mockscow Mule, and it’s a great one to wake up with too! Practitioners of Chinese medicine have prescribed watermelon juice as part of a daily diet for centuries because it is known to be good for digestion. Although watermelon is 92% water, each bite is packed with lycopene, antioxidants, amino acids, potassium, and Vitamins A, B6, and C. Watermelon helps reduce your risk of heart disease, is an inhibitor of inflammation, great for hydration and digestion, stellar for you skin and hair because it promotes new collagen and elastin cells, shown to prevent muscle soreness, and its lycopene may be helpful in reducing the risk of cancer. Muddle watermelon juice with mint leaves. Pour juice over ice in a tumbler glass, add lime juice and zest. Top with ginger beer. Garnish with mint leaves.